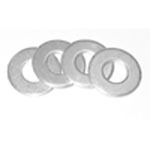 #6 flat washer. 5/32-inch (4mm) inner diameter, 1/16-inch thick. Replaces Bally/Williams #4700-00090-00 and Data East / Sega / Stern # 242-5001-00. Sold individually. Image is sample only- actual item may vary.